Oh dear, we feared the worst. Rain forecast all day! It was supposed to be showery though so I packed my Mamiya 7 camera, Gitzo tripod and Ilford FP4 film. The rain started as we stepped out of the hotel in Thirlspot, it obviously recognised us! It was very heavy for an hour or so, quite unpleasant as we climbed steeply. Clouds were down on the tops so no views for the first 2.5 hours to the summit. 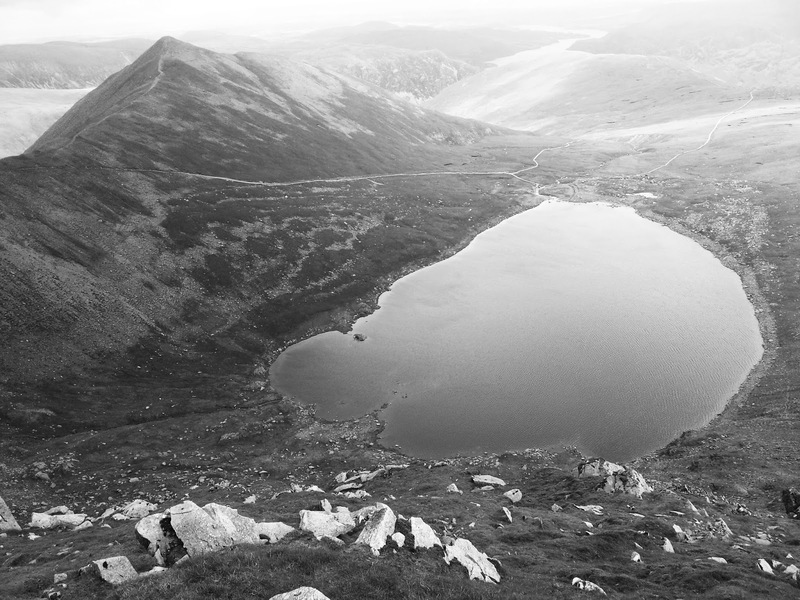 Then a brief view of Catstye Cam before we reached the summit shelter. After a half hour flapjack break we moved off, I was hoping we might drop below the clouds as we descended, and we did. Clouds stayed low but off most of the tops and the sun was moving across the view every now and then. 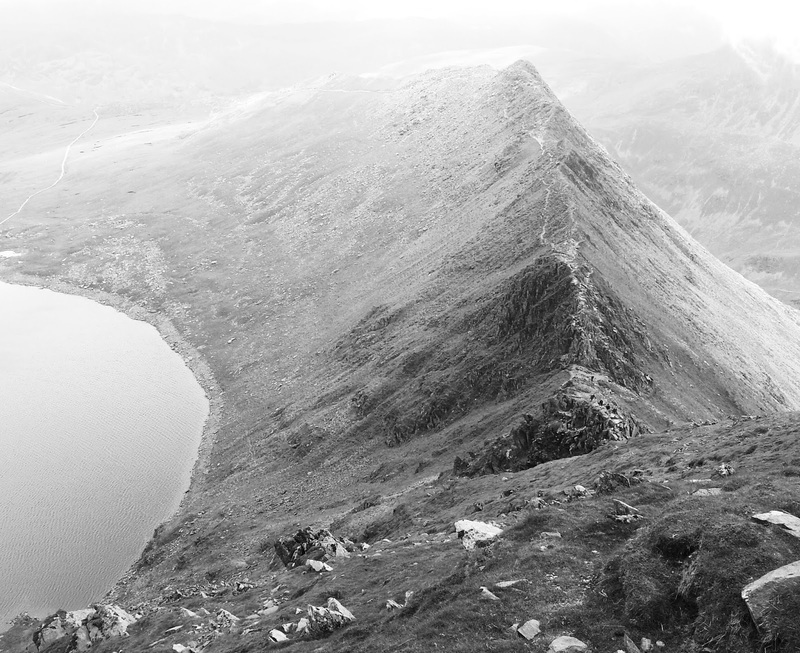 I took lots of photos of Striding Edge ridge and Red Tarn. It was worth carrying all the camera gear after all! 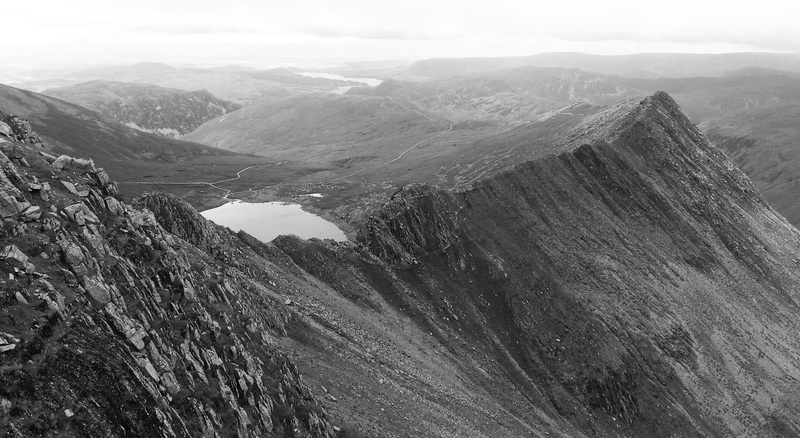 As I was photographing the Edge a man slowly worked his way across to me from Striding Edge, I was well away from the main trail above some cliffs. We had a chat, turned out he had published a book of photographs of the battlefields of World War 1, he was Mike Sheils. It closed in a bit and looked like a storm was about to strike but didn’t. No more photos. Down to Grasmere and Tweedies Bar. 8 beers on, we knew straight away we had our work cut out this evening!